On the one hand, there is the depth of my ignorance of Egyptian history and Arab cultures (which is considerably more profound than anything I am about to say here). On the other, there is – unless something is lost (or added) in translation – a playful author who likes to keep his reader in a state of constant uncertainty. In the opening paragraph, Ibn Shalaby is invited by the Fatimid caliph Mu‘izz to break the Ramadan fast – the first ever in the new city of Cairo. The second paragraph tells how he first met Mu‘izz in Qayrawan some years earlier, and how several centuries later he met the British historian of Cairo, Stanley Lane-Pool – they immediately recognised each other but it takes them a moment to recall that it was in Mu‘izz’s court in Qayrawan. In the third paragraph, they go to drink tea and smoke a pipe together so that in the fourth paragraph Lane-Pool can outline some Egyptian history before disappearing in the fifth paragraph so as to stiff Ibn Shalaby with the bill. When he tries to do a runner he timeslips into an earlier and unfamiliar version of the city, where he recognises Maqrizi, a 13th/14th century historian – only it soon transpires that the Mamluk-era author of the famous Topography is also capable of timeslipping, since the year is 358 AH (969 AD). Which means Ibn Shalaby is actually on time for the founding of Cairo, after all – as are other timeslipped historical figures, such as the historian Ibn Taghribirdi and the novelist Naguib Mahfouz. And so the novel unfurls, a concatenation of comic incidents and episodes, many of which are interrupted by timeslips (both unintended and deliberate), constantly looping around and back and through the Fatimid, Ayyubid and Mamluk periods, with an occasional return to the 1990s. It is not always clear when or where we are, and even when Ibn Shalaby looks at his watch that tells him the date, you cannot always be certain how soon before he notes the new date that he timeslipped. At one point, even he confesses that ‘because of all my bouncing around in history, I tended to confuse one period with another’ (121) – and he’s the narrator! The Time Travels of the Man Who Sold Pickles and Sweets is not the first African time-travel story. The earliest African sf I have yet found is a time-travel novel, Muhammad al-Muwaylihi’s A Period of Time, which began newspaper serialisation in Misbah al-Sharq/Light of the East in 1898, was published in book form in 1907 and saw a sequel in 1927 (it has just been translated and published in its entirety for the first time, and I should be reviewing it later this year). Salam Musa’s Khimi (1926) time-travels into a soulless future (apparently – it is not translated as far as I can discover), as more or less does Tawfiq Al-Hakim’s Ahl al-kahf/Sleepers in the Cave (1933; translated 1989), which I have not yet read. And there is the 1998 movie Risala ila al-wali, which seems similar to the French comedy Les Visiteurs (Poiré 1993), but I have yet to unearth a subtitled version. 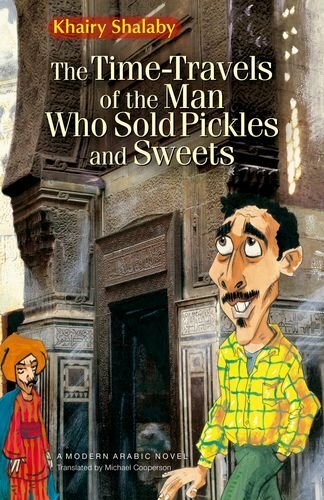 Oh, and the full title of Khairy Shalaby’s novel is The Time-Travels of the Man Who Sold Pickles and Sweets. A Narrative Comprising Events to Dazzle and Astound, Meditations to Divert and Confound, Histories to Edify and Incidents to Horrify. By the Pen of God’s Neediest Creature, the Knowing but Unlearned, the Tutored by Unwise Ibn Shalby, the Hanafi and Egyptian, The Seller of Pickles and Sweets. May God Guard Us from His Ignorance, Amen!